Put your mind at ease, says the Lord. You have worried long enough over the situations that seem out of control in your life and of those you love. I have heard your prayers. I see the need! 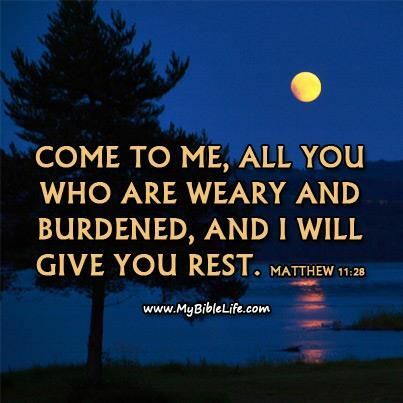 I am aware of your weariness. Just rest in Me. You cannot fix the problems, but I can. You are not the provider. I Am. Although I have called you to bear the burdens of others, I was not suggesting that you do this alone. My easy yoke and light burden awaits you in My presence, says the Lord. Even as I am touched by the very feeling of your infirmities, you are feeling the pain of others as well as your own. I do not want you to be weighed down with concerns, says the Lord. I Am the burden bearer as you learn to depend completely upon me for yourself and those that you love. I love them more, says the Lord. I love you! Yes, I have you all in the palm of My hands, and I am on task today and always. Your selfless love touches My very heart, says the Lord. Yes, I am pleased with your selflessness. But do not fret. I will answer. I will! I have sustained you and those you love in the past, haven’t I? I have never failed you yet. I will not fail you now or ever! So shift these heavy burdens upon Me and know that I care for you and will give you the breakthrough you are longing for. Just settle it in your mind today that I Am the answer to all your concerns that are big and small, and I desire your heart to be as carefree as a playful child as you trust me to handle all your problems and meet all your needs, says the Lord.